Together with Ulrike three skateboarders, two from Janwaar – Arun and Ramkesh – and one from Kovalam, Kerala – Sujin – are currently travelling in Europe. Their goal is to become even better changemakers and empower them to take a lead and guide other kids on their ways. “Why them?” many people are asking me. To be very honest there is no clear answer to this. What I can say though is that all of them performed very well at a skateboarding challenge last November. They are really good skateboarders, no doubt. But what was even better than their skatbeoarding performance was the way they interacted with others and how they’ve been accepted in their own communities because of their social behaviour. They simply stood out from the rest. They will visit Heidelberg, Berlin and Gummersbach in Germany, then they go to Antwerp in Belgium, Lille, Paris and Bordeaux are their stops in France France and they will end in Barcelona, Spain. They will meet young people of their age, they will interact with them, exchange ideas and explore new territories. It will help them to become champions of their own. They are holding passports, visas and airplane tickets and they are ready to go to tell their stories of change and spread the skateboarding bug. Ramkesh, age 10, Arun, age 14 and Sujin, age 16, live in small villages in the rural parts of the country – far away from sanitation, electricity and any kind of comfort. All of them are tribals – they don’t belong to any caste and they are usually the ones who are suppressed in their villages. They are considered as “impure”. Skateboarding has changed their lives. It brought them back to school and offered new chances and opportunities. And they’ve taken their chance. Among many others these three young skateboarders have become a beacon for change through skateboarding the whole world over. This trip will give them the chance to become even better change makers and empower them to take a lead and guide other kids on their ways. Heidelberg is the hometown of Ulrike, the initiator and driving force behind this change process. There, Ramkesh, Arun and Sujin will have their first skateboarding sessions and get adjusted to the time, climate, food and culture. Berlin will hold a lot for the kids besides its stunning “tourist” spots. They will deeply dive into the skateboarding Mecca. On September 16 we’ll hold a huge event at Decathlon’s main store on Berlin Alexanderplatz and then we’ll all go to Mellowpark to party a bit. At Mellowpark the kids will stay for a few days. The Skatehalle Berlin with its huge Nike SB skatepark will host the kids and organize an event. A visit to the Heinrich Böll Stiftung is scheduled as well. The third week they’ll spend in Belgium and France. In Antwerp they become part of the Antwerp Skateboarding Week. From Antwerp they go to Lille and visit the Decathlon headquarters. An interaction with the skateboarding team is planned as well as a after work skateboarding session and party! 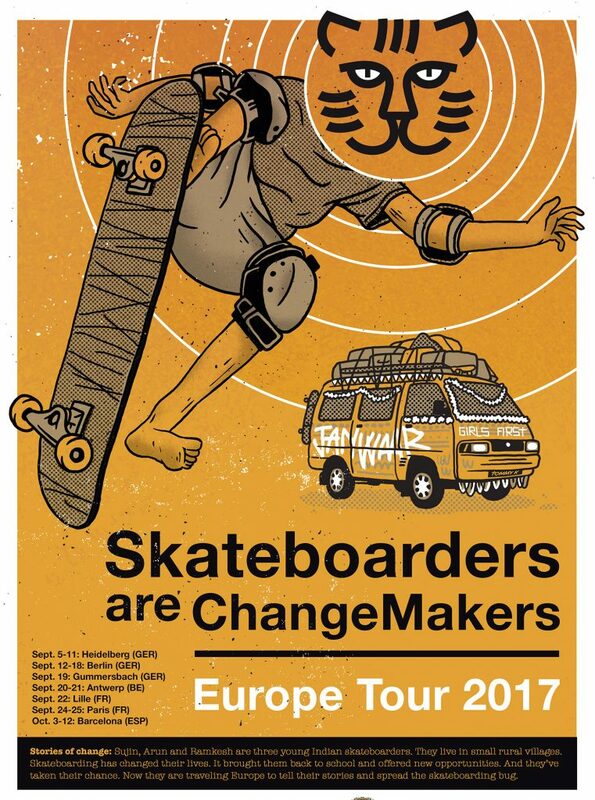 Via Paris they’ll then go on to the Hangar Darwin Skatepark in Bordeaux where we have arranged another huge event. The last week they’ll spend in the skateboarding paradise Barcelona. Skateboarders say it’s one of the best skateboarding spots in the world. We are just finalising the schedule there. With this one of a kind experience behind them, Ramkesh, Arun and Sujin will inspire many more young skateboarders back home in India and it surely will help them to strengthen their role as trailblazers and young change makers! The tour is supported by the Heinrich Böll Stiftung in Berlin and Delhi, by oxelo Decathlon, by Mannan Gupta, Niko Lai, Julian Sroczinski, Antonella “Geeta” Zurini and by many friends who will host the kids and who have sponsored their travels! It’s a true community effort! A huge THANKS to all of them.